Dr. Anand received his Ph.D. degree in Electrical Engineering from the University of Illinois at Urbana-Champaign, IL, USA in 2015, and M.Tech. degree (distinction) in Electronics Design and Technology from the Indian Institute of Science, Bangalore, India, in 2008. He worked at IBM T. J. Watson Research Center, Yorktown Heights, NY USA, with RF Circuits and Systems group in the summer of 2015. From 2008 to 2010, he worked as an Analog Design Engineer at Cosmic Circuits (now Cadence), Bangalore. His research focuses on wireline communication, frequency synthesizers and sensors with an emphasis on energy efficiency. 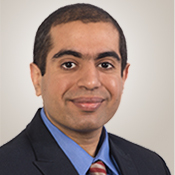 Dr. Anand is a recipient of 2014-15 IEEE Solid-State Circuits Society Predoctoral Achievement Award, the 2015 Broadcom Foundation University Research Competition Award (BFURC), the 2015 M. E. Van Valkenburg Graduate Research Award from the University of Illinois, the 2013 Analog Devices Outstanding Student Designer Award, and the 2009 CEDT Design (Gold) Medal from the Indian Institute of Science, Bangalore, India.